Lawn bowls is a tactical and challenging game. The balls are commonly referred to as bowls or woods. Although they look round, they're not symmetrical. One side is shaved down so that the bowl travels in a curve. The bulkier side is known as the "bias." The object of the game is to get as many of your bowls as close as possible to the small jack. Knocking your opponent's bowls out of the way will increase your score. Build up a variety of lawn bowls techniques to improve your chances of landing right next to the jack. Hold the bowl in your strongest hand. Feel the bowl—one side is slightly flatter and the other slightly heavier. The bowl will curve in the direction of the biased side. Look for a large, colored medallion on the larger side. Position your middle finger along the running edge of the bowl. This is the line directly between the face of the bias and the shaved sides. Your finger helps guide the bowl. Use your thumb and index finger to keep the bowl stable on each side. Stand in a comfortable, loose position a step or two from the launch line. 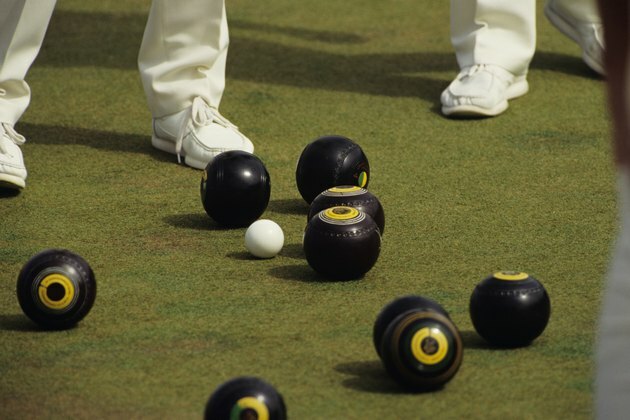 Keep your shoulders square to the line you're aiming for, according to Fred Fern Lawn Bowls. Align your arm dead-straight to the aim line, not across your body or out to the side. Take a step toward the throw line. Bend your legs and roll the ball smoothly onto the green. Lean your free arm against your leg to keep yourself steady and accurate. End up in a semi-crouch position, low to the ground with the front foot pointing in the direction of the moving bowl. Practice a few shots to get a feel for the speed of the green. Short or wet grass means faster bowls. Bowl a slow, steady shot if you want to curve in toward the jack. Roll a stronger shot if you're trying a more direct tactic. Aim slightly to the right if you're curving left into the jack. Flip the bowl in your hand to curl in the reverse direction, known as a "backhand draw," according to the BBC. Roll the bowl very hard to make a "drive" or "hit" shot. This is designed to knock your opponent out of the way. Aim directly at the target ball. Throw hard to eliminate the curve as much as possible. Aim for easier targets. For example, two opponent balls close together is an easier target than one ball. Block opponent shots if your bowl is closest to the jack by aiming bowls in front of the jack. That means your opponent has to get around your first ball. Experiment with different grips and throwing positions until you find the one that's most comfortable for you. What Are Some Other Games Played on a Pingpong Table?